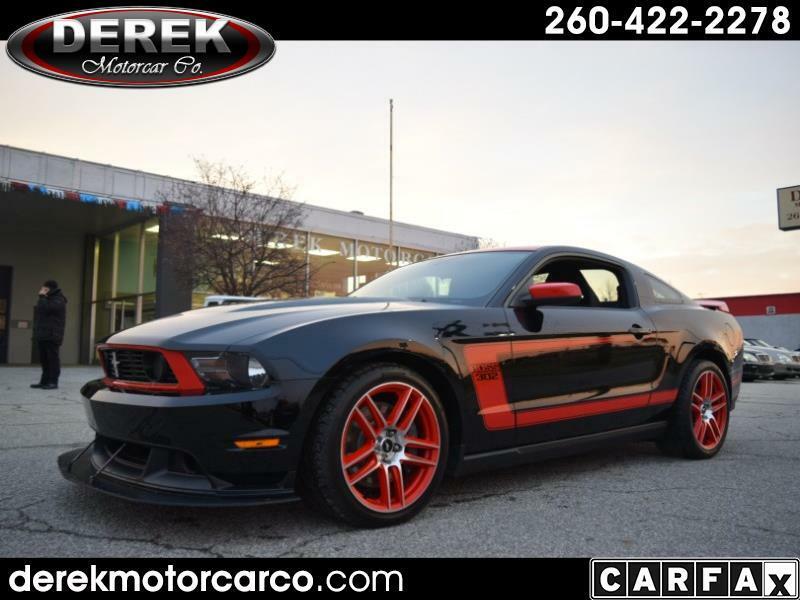 Used 2012 Ford Mustang Boss 302 for Sale in Fort Wayne IN 46805 Derek Motorcar Co. This Limited production Laguna Seca package is named to commemorate the first-place BOSS 302 finish at the 1970 Trans-Am series opener. The 2012 Ford Mustang Boss 302 Laguna Seca fastback is one of 767 built for the 2012 model year. It’s powered by a 302ci, 4V TI-VCT, normally aspirated, high-output, hand-built V8 engine producing 444hp, backed by a 6-speed manual transmission. The Laguna Seca Edition package includes unique suspension tuning with fully adjustable shock absorbers and a special quad exhaust. The Boss 302 brake system is engineered to improve stopping on both road and track with a Brembo braking system. The Laguna Seca specific front air-splitter gives the Boss 302 a more aggressive look, while generating additional downforce for road handling. It has the rear seat delete option with torsional stabilizer brace for handling and increased torsional rigidity. It features Laguna Seca exterior badging, graphics, color scheme and the three-gauge package positioned on top of the instrument panel. This Boss rides on 19” Laguna Seca wheels, race-compound tires, and has a rear spoiler. It also has the factory Recaro seats option. Accompanying this Boss is a copy of the original Window Sticker, original red track-key, and the original owner’s manual and pouch. The Tracmode powertrain control software provides this Boss 302 full racing calibration and a two-stage launch control. This Boss 302 has 4,510 actual miles and a clean CARFAX history.